Welcome to Greg Hinnant Ministries! A Bible centered Christian teaching ministry, offering books, teachings, CDs, and courses that emphasize discipleship, spiritual growth and challenge believers to become overcomers. Our motto, "Helping prepare the way of the Lord," expresses our primary purpose, prayer, and passion: to do everything we can to help the body of Christ become "a people prepared for the Lord" (Luke 1:17). 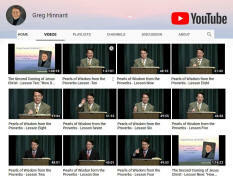 For video and audio teachings, including the Second Coming, visit our YouTube Channel playlist. A lifelong resident of North Carolina, Greg Hinnant was called aside many years ago from his chosen field of music education, and later from the business world, to an extended period of preparation for Christian ministry. His present teaching and writing ministries are founded on years of devotional and systematic study of the Bible and Christian history, and have been strongly influenced by... more Please read, "His Broken Home," on our Devotional Page. And sign up for Greg's e-devotionals at the "Join Our Email list" notice below. To view Greg's 90-page Syllabus / Study Guide for his new ten-part series, "The Second Coming," Click Here. Also, ask us about Greg's new, exciting seven-part series, "The Tribulation Story: A story you need to hear about a time you want to escape."